Thicker bats, flatter tracks and plummeting quality of bowlers means a tilt of weight in the favor of batsmen. With every IPL match that I watch, my mental image of Cricket as a batsman’s game becomes ever clearer. No score is unattainable anymore and no target is big enough to intimidate modern teams. Players these days back themselves to achieve any target. So we have complied an exclusive list of the ODI matches with maximum number of runs scored in them. Rated as one of the best ODI games to have ever being witnessed, this match saw breaking of various old records and saw the inception of many new ones. Batting first, Australia scored a mammoth 434 thanks to the heroics from Ricky Ponting who scored a ruthless 164. While taking the field for defending this edifice of a score, no Australian player would have even imagined that they would be leaving the field with morose expressions embellishing their face. 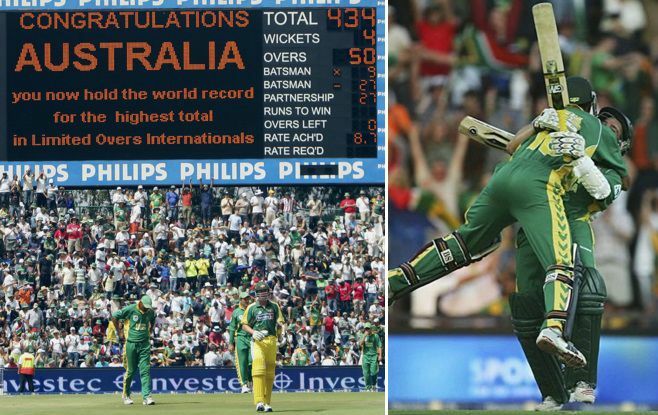 A charged up South African team surpassed the 434 score on the last delivery and won match by a single wicket. Gibbs was the chief destructor who scored 175 and had received ample support from GC Smith who managed 90 runs in this famous victory for South Africa. 872 runs were scored in this match, a record which stands yet to broken even a decade after its creation. In the summer of 2015, England took New Zealand on in front of a peculiarly English crowd at Kennington Oval. Kiwi middle order stalwart, Ross Taylor made no secret of his intentions as he went after English bowlers like a hound chases a frightened rabbit. There was nothing that would suggest a different end for English bowlers then a rabbit usually experiences as it ends into the clutches of the hound. Ross Taylor’s 119 powered New Zealand to an unassailable total of 398. Though Eoin Morgan and Alex Hales provided England with moments of nonchalant brilliance, yet it was too little too late an effort as England succumbed at 365. In total 763 runs were accumulated in this encounter. Jo-Berg has developed some sort of a reputation for a venue which is flush with runs. Probably it has got something to do with short boundaries. Many would remember the match under discussion as the one in which the belligerent AB de Villiers decided to unleash havoc on the boys from Caribbean. AB smashed the record for the world’s fastest century as he achieved the feat on mere 31 balls. Only three batsmen opened their accounts for South Africa and all of them scored centuries. Hashim Amla’s 150+ got overshadowed by AB’s exuberance. In reply to the mammoth South African 439, West Indies could only muster 291. Still the overall runs scored in this match – 730 – were enough to place it 4 th in our list. Sachin Tendulkar reigned over this match just like scores of other matches he had single handedly taken away from oppositions. Batting first, India mustered eight runs less than 400 thanks to 163 from Sachin. Crowd in Christchurch had full worth for their money as they got to see Jessie Ryder’s hitting after witnessing a sumptuous knock by Sachin. Jessie’s ton was not enough to help New Zealand win this match. New Zealand got all out for 334 in the 46 th over. Overall runs scored in this match were 726. India is a powerhouse in world’s batting so no one should be surprised to see India’s name so many times in the list. In the past decade or so Indian batsmen have accumulated runs like aunts accumulate food in their burrows. This match is a tale of a classical chase. Batting first, Australia had set a sizeable total of 359 for India to chase. Irony is India chased it down with only 1 wicket down and in the 44 th over. No prizes for guessing the names of architects of this Indian victory. The three young Indian guns: Dhawan, Sharma and Kohli were too hot to be handled. With 721 runs being scored, this match comes 6 th in our list. Cricket returned to Pakistan after a hiatus of 6 years and the return couldn’t have been more exuberant. The historical Qaddafi Stadium lit up with runs from both sides. Shoaib Maliks’s 112 powered Pakistan to a majestic 375, a total which Pakistan should have easily defended. But, Zimbabwe clearly at one point threatened to chase it down. Elton Chigumbura Masakadza dug in for Zimbabwe with Elton scoring a ton. Zimbabwe lost the courage to score any further after scoring 334. Overall, 709 runs were scored in this contest. It isn’t a common spectacle. Seeing a batsman surpass the magical figure of 200 in ODIs is a rare thing. This is exactly what Rohit Sharma did in this match. He seemed to have been playing against kids form streets as he plundered runs all around the ground. Indian total of 383 never came under a serious threat until the point Faulkner walked in. He had intent but he started running out of partners before losing his own wicket but not before he scored an impressive 116. Australia got all out for 326 with an overall run total of the match at 709. There is a reason why bowlers dread touring India. Pitches are anything but helpful for bowlers. Even after scoring 350+, a team can’t be sure of victory as anything is chaseable in India. Batting first, Australia scored 350 with centuries from Watson and Bailey. Dhawan and Kohli once again starred for India in this chase as each of them scored centuries. India scored 351 and overall run total of the match became 701. In the 4 th ODI of the series between the two countries, England got its revenge for the earlier loss in the series when Kiwi batsmen proved too good for English bowlers. Batting first New Zealand managed an impressive 349 with Kane Williamson starring with 90 runs. Cricket’s latest sensation, Joe Root and impressive Morgan scored centuries enabling England to chase down the total in 44 overs. 699 runs were scored in this match. If you were little observant, you must have noticed that all these highest scoring cricketing matches have happened in the last decade or so which is once again reminiscence of the fact that Cricket is largely becoming a batsman’s game.